It’s Science Literacy Week and this year we’ve added movies to the calendar, selected from the Kanopy streaming video service. 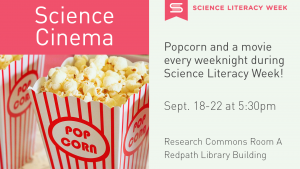 We will also have popcorn, so be sure to join us at 5:30pm in the Redpath Library Building, Research Commons Room A, where the visualization wall is perfect for screenings. Wednesday: Queen of the Sun: What are the Bees Telling Us? With Kanopy in the Library collection, every day can be movie day. Whether you love classic films or documentaries, there is plenty to explore. Web of Science redesigned its website to make it easier to search and review your results. Check it out and let us know if you have any questions. Below is a 5-minute tour of the new Web of Science. I had never really considered the deforestation involved in carving out the Canada / U.S. border. It is a long (8,800 km) deforested wonky line. 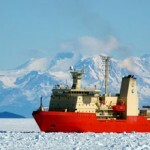 This may not be the most seasonal of posts, considering today is the first day of summer, or the most current, since this video caused quite a sensation more than a month ago – but who can resist a gorgeous time-lapse video of an ice breaker traveling through Antarctic waters? 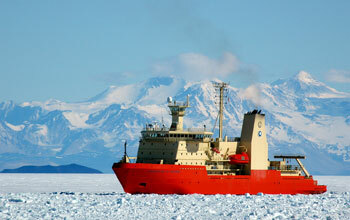 Cassandra Brooks, a Stanford University doctoral student with the Emmett Interdisciplinary Program in Environment and Resources, produced this video aboard the icebreaker, Nathaniel B. Palmer. The video is a time-lapse sequence, compressing about 60 days into less than five minutes. Enjoy! Who doesn’t love Internet Archive? I am a big user of the Wayback Machine, where they are capturing and archiving websites back to 1996. Take some time to explore thier site and you will certainly find something in the audio, video, or text archive (they recently hit 10 petabytes). For example, I have been listening to a radio mystery series called Mr. and Mrs. North that aired on CBS from 1942 to 1954. What I didn’t realize about Internet Archive is that they are collecting print books with the goal of archiving one copy of every book ever printed – watch this video – it will blow your mind. Internet Archive from Deepspeed media on Vimeo. These engineering students at Northwestern University are learning to think on their feet. Anyone up for dance classes? Can you explain your research activities or thesis in 3 minutes to someone outside your field? Jinna Kim in University Affairs reports that many universities are holding prize-winning competitions that require graduate student participants to communicate their work to judges and an audience in just 3 minutes. The idea is to teach students how to promote themselves and their research. Two guys walk into a bar – they just happen to be CERN scientists and they can help explain Higgs boson excitation of the Higgs field. This particle physics video is one of a series of five videos from TEDxCERN. Waltch all five on the TED blog for a little on the birth of the universe, the history of the web and big data, dark matter, and antimatter. 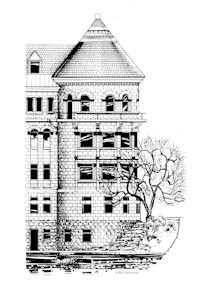 Look up to your right when you enter the Frank Dawson Adams Building from the campus side (or from the Roddick Gates side). There’s a shiny new cupola that was placed on the roof of the Macdonald Stewart Library Building this week. Read more about the raising of our roof, and see a brief video of the installation, in the McGill Reporter. As humans, we all need water. The ecosystems of Earth need water too. Unfortunately, many rivers run dry from overuse. If you don’t want to see this happen, one of the things you can do is save the water that you consume every day. Here are some tips. You can also take the pledge at Change the Course to help restore the Colorado River. Every pledge will return 1,000 gallons to this river. If you are interested in learning more about freshwater and why it is so important to the world, I would recommend National Geographic’s Freshwater 101 to start your research.